If you are short on credits required to graduate from your local school system, or if you are simply looking to get ahead on credits, Excel High School can help. EHS offers open enrollment for all of our accredited, online summer school courses. Excel’s online summer school courses are very flexible, so students are able to enroll anytime, and get started with their summer school courses within a matter of hours. There are many situations where students are not able to attend traditional summer school and that is where summer school courses online can really help with the convenience factor. If you have a trip planned to be away this summer, online summer school courses travel with you, so online learning is a great option. Online summer school courses at Excel High School are very practical; and since Excel High School is a State Department of Education, recognized, accredited high school, you can be sure your credits will transfer back to other public or private accredited high schools. Excel High School offers math, science, English, social studies and elective courses 100% online over the summer. All you need is a computer, tablet or other device and access to the Internet, and you will be able to start your online summer school courses. Don’t let your summer waste away by sitting in a classroom. 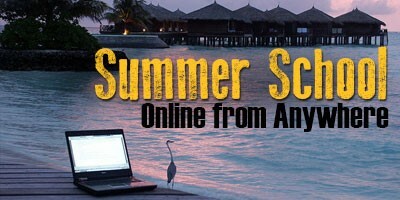 Instead, take all the summer school online courses you need and get ahead for next year. Excel also offers credit recovery courses all year round, so enroll now and get started in online classes today! Call 800-620-3844 or initiate a live online chat. We are here to help solve your summer school dilemma.